I can sit down with a pen and paper and roughly sketch out ideas from out of the blue for at least ten pieces in an hour. Notebooks full of new ideas sit on my bookcase. Maybe half of the ideas have potential and one comes to fruition. This low ratio is because there is only so much time, some ideas are just unworkable, and some need more development. Well, all need more development and the final piece may end up quite different from the original idea. But if I sit down with a pen and paper with feathers in hand, ideas come much faster and they are better. The curve of a shaft as well as the shape and size are primary factors in the designing. The Capercaillie, the largest of the world’s grouse that lives from Siberia to Scotland, has large flank feathers that half twist down the shaft in a lovely sort of way. Playing with two matching feathers, I noticed that they fit together like the two halves of a tennis ball: they made sort of a sphere. What birds do and how they look also assist me. The way a male golden pheasants bright orange triangular neck cape coils forward when it displays is sort of a golden spiral. Woodpeckers peck. Pigeons sit on wires. Concepts and meaning. Take crows for example. They are loud, live amongst us and we know them…sort of; they are social, and fly. These things can communicate strong meaning. Their black feathers lend themselves to stark expression. Inspiration from other people. Since ideas and inventions are built on older ones, I draw inspiration from others' work—like M.C.Escher’s themes for instance. 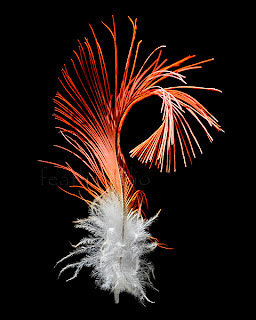 When I wanted to express the general idea of change and transformation which he seemed captivated with, the kind of feather I found didn’t matter too much. So the one I used, from a Demoiselle Crane, ended up informing the size and background of the finished piece.